Hello Fab Free’rs, and welcome back to the blog for another edition of Fab Free Designer Friday. This week I get to talk about Deadly Nightshade. Not the plant, the shop! Deadly Nightshade is self-described as “bringing you quality avatar accessories of the magical and otherworldly varieties.” After browsing the shop, I felt like it was a sort of Second Life version of an Occult shop. At Deadly Nightshade you’d purchase accessories and other items to aid in an otherworldly or magical appearance. Most of the items I encountered are unisex as well, so the guys can get accessorized also. The Deadly Nightshade shop has a very minimalist setup with signage on the floor guiding you to different types of merchandise. There are walking accessories, wearable auras, gachas, and more to explore. I even spotted a tiny bit of women’s clothing, and some decor. The landing point is a round central room where you’ll find everything you need in regards to shop information, group gifts, and events. Fitting with the round room, the circulation desk at Deadly Nightshade is also round. You’ll want to check out the desk, it’s where you’ll find the Fabulously Free in SL group gift. Both the Fab Free group and the Deadly Nightshade group are FREE to join. So if you’re looking for something different, something magical perhaps, you won’t want to miss out on these Fabulous FREEBies! Categories: accessories, FabFree Group Gifts, fantasy | Tags: Alternative Fashion, Deadly Nightshade, designer Friday, fab free, Fab Free Designer Friday, Fab Free Gift, Fab Free in SL, fabfre, fabfree in sl, fabulously free in SL, fantasy, FFFDF, free gifts, Free Gifts in SL, Free Group Gifts, free group join, free in sl, gifts in SL, goth, group gifts, Occult Accessories, Occult Shop, Otherworldly Accessories, Pagan, Prudence Rexroth, Second Life, sl, SL Freebies, unisex, Wiccan | Permalink. I put a spell on you, and now you’re mine. Okay, maybe not! There’s really no witchcraft needed for this witchy alternative look. Just a few group gifts are all you need, so keep reading for the details on how to get them. This wild hairstyle is the most recent Fabulously Free in SL group gift by Adoness. It’s a fun side-swept style comes in 3 colors, a vibrant orange, a deep green, and the rich burgundy color shown. Also included in the gift are 3 matching system layer hair bases. I used the default Catwa hair base. To get your copy of this FREE gift, just wear your Fabulously Free in SL group tag and head over to Adoness. Then click the group gift vendor behind the counter. If you’re not already a Fab Free group member, not to worry, the group is FREE to join. I’ve always liked the theme of “good and evil” which is one reason I picked up these floating skulls from Evermore. They are a current group gift and the Evermore group is just 50 linden to join. There are two versions of these precariously floating skulls included in this fun group gift. The set shown has one plain black skull, and one plain white skull. The second set of skulls are also black and white but have a glowing emblem on their foreheads. I really think they are such a cool and sinister accessory. Finally this cute little tank top is a current group gift available at OOPS. I love the slightly macabre imagery and the phrase reminds me of several things I love about Halloween. This is also the sort of top I’d wear year-round, not just during the Halloween season. The OOPS group is just 10 linden to join, and there are several group gifts available at this time, including the sweaters I previously blogged in my “Creepy and Cute” post. 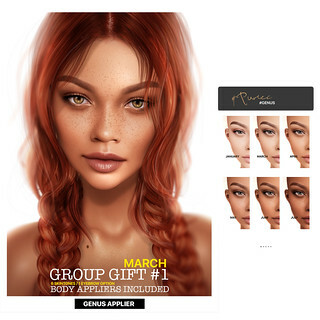 Categories: accessories, FabFree Group Gifts, Free, group gifts, groups, hair, mesh, other, shirt, skins, Uncategorized | Tags: Adoness, Adoness Fab Free Group Gift, Adoness FabFree Gift, Adoness Hair, Alternative Fashion, Catwa, Catwa Sofia, diesel works, Essences, Essences Tawny, Essences VIP Gift, Evermore, Evermore Group Gift, Evermore Raven, Evermore Raven Group, fab free, Fab Free Gift, Fab Free in SL, fabfree, fabfree in sl, fabulously free in SL, fashion, Fashion Freebie, female fashion, floating skulls, free, free fashion, free group gift, Free Group Gifts, Free Hair, free in sl, freebie, I put a spell on you, Maitreya Lara, OOPS, OOPS Group Gift, Prudence Rexroth, skulls, sl, sl freebie, Virtual Fashion | Permalink. Today was definitely a big cozy sweater day for me. I wanted nothing more than to curl up on my sofa, have some coffee or maybe some warm tea and watch movies… all day. This sweater from BlackRose is exactly the type of sweater I envision for these sort of days. What better hairstyle than this one by Runaway to go with an over-sized sweater?! I love bun hairstyles because I think they have the effect of “look how cute my hair is” without much effort. To get this red knit sweater by BlackRose for FREE, wear your Fabulously Free in SL group tag and head over to the BlackRose main store. Once inside, you’ll see a little gift table on the wall to the left. While wearing your Fab Free group tag, click the little gift bag on the shelf and your FREE gift will be delivered to you. This baggy, cowl necked sweater comes in standard mesh sizes. To complete the look, you’ll need this FREE hairstyle from Runaway as well. You can pick up this FREE gift at the current round of Hairology. As it’s been mentioned before, Hairology is celebrating their first anniversary. The event is a year old, and you’ll find several gifts that are freebies and dollarbies. Included with this gift hairstyle is an “essentials” color change hud that has a nice variety of hair colors. Categories: events, Free, group gifts, hair, mesh, shirt | Tags: $0L, 0 linden, BlackRose, Catwa Gwen, Essences, Essences Tony, Fab Free Gift, fabfree, fabfree sl, fabulously free in SL, Fall Fashion, fashion, free, free fashion, free gift, free in sl, Hairology, Hairology Anniversary, Hairology Anniversary Gifts, indigo, Maitreya Lara, Prudence Rexroth, R+a, Runaway, Second Life, Shiny Shabby, sl, sl freebie, sweater | Permalink.